Pressure sensitive backing sticks to almost any standard shipping surface. Fast, simple application-simply peel off paper backing and apply to package. Protects shipping documents from moisture, dirt and abrasion. 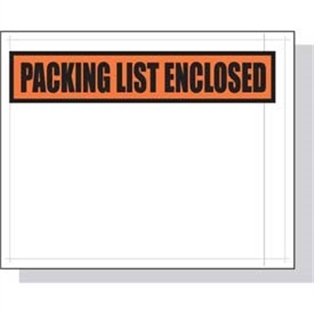 Back loading envelopes provide tamper evident protection. Envelopes are made with 2.5 MIL facing, 2.25 MIL backing and 1 MIL of adhesive on a 50# paper backing.